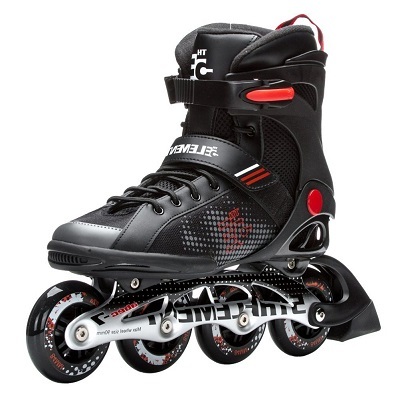 There are a lot of important factors when looking at the overall quality of an inline skate. The structure and fit play a huge role in the way you use your skates. A poor fit, whether too small or too large, will lead to an array of problems such as blistering, ingrown toenails, hammertoes, or bunions. The enjoyment that you get from riding will have this activity as a top choice in your next exercise session. Within the top 10 rollerblades, we have something for everyone. Adjustable sizing is offered in a lot of skates and is very important to get the best for your buck. Several of the skates in our guide will grow with your skater. We have added the criteria used to choose the top 10 and an FAQ section, to help everyone increase their knowledge and have a great ride! This brand is synonymous with quality for obvious reasons. Trusted by athletes all over the world the Spitfire skate is bound to strike passion in the world of blading. Innovation in frame, closure, uppers, wheels, and bearings guarantee exceptional performance and quality for years to come. Expandable for growing feet this skate will save you time and money. It is a great pair, made by a great company, making sure to give the quality that you expect when you hear the Rollerblade name. When it comes down to it, feet grow fast. This skate has an easy push button adjustment to allow growth up to 4 sizes. We all want to ensure excellent quality in the recreation gear we buy, we also want to make sure to get the longest wear for our hard earned money. The longevity of this skate will keep the thrill of riding at it's maximum and save you money at the same time. All of the components help to give it a superior fit. From the adjustable frame to the multiple closures and of course the top rated wheels and bearings this skate exceeds your fit expectations. A great fit with your skate helps improve balance and skateability. Bauer is a name trusted in all things ice hockey, naturally, as street hockey has become more popular, they have expanded their line to inline street skates. Technology and experience give you the high-performance, quality gear needed to give your best performance, at tomorrow's game. Rollerblades vary in use and these are for a high-level game that sports enthusiasts love. Trusted by professionals, this amazing pair is built by a company that knows structure and form. If you are looking to be the best in your street hockey games try these skates that will give you top quality performance. The build of this is based off of the top quality structure and build their tried and tested ice skates have been offering athletes for generations. Adventures in exciting sports lead to some hard earned sweat. Continuous moisture on the feet can cause all sorts of uncomfortable foot issues including blisters, fungal and bacterial growth, and sore feet that can prevent top quality skating. The microfiber lining wicks moisture away from the foot keeping feet comfortable and dry during the hardest training sessions. Roller Derby skates are a multi-purpose skate used for beginners, all the way to expert junior skaters. The Stinger is the beginning of a long relationship between you and the Roller Derby brand. Roller Derby has been in the derby skate business for more than 80 years and gives you a great quality skate for multiple skill levels. America's skate company has something to offer all skaters and this is a great place to start. These ensure your love for rollerblading continues for generations to come. Spills, scrapes, and general mess tend to find its way into the lives of beginners. A removable liner makes cleaning quick and easy. We spend a lot of our lives cleaning up messes and we don't want to add to the burden with yet another piece of recreational equipment. The liner pulls out with ease and is machine washable keeping these looking good and smelling good without any added work. If an inexperienced skater always needs your help getting their skates on and off you will be spending a ton of time away from other things that may need doing. The pull and tighten laces will make it easy for your new skater to put them on and off as they please. Great structure and easy push button fit combined with the easy lacing system make these a great starter skate. Top quality features paired with outstanding performance make 5th Element an excellent next pair of skates. You get an excellent transfer of power during your toughest trail ride or hockey game. Firm support of the ankle and multiple support closures promote performance with stability and style. Made for a more experienced skater keep the thrill of rollerblading with great speed, comfort, support, and stability with 5th Element Stealth 84. Making the most of every stride is very important when on those long roller or when you find yourself in overtime at your weekly game. The construction of the chassis makes sure to keep you skating longer and stronger. The best-built skates, use aluminum to the skater's advantage and offer speed and consistency for all your rides. A high cuff and triple locking closures support your ankles and your feet. Keeping your feet comfortable and supported is a number one goal when you want to skate on a daily basis. Lace, buckle and strap yourself in for a ride you won't forget because of how great your feet and ankles will feel in the morning. 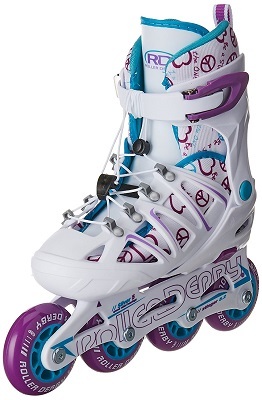 These adjustable inline skates are great fun for your young skaters. They feature illuminating wheels and great ankle support which is so important in a skate. The padding inside is comfortable and the build is also high quality. 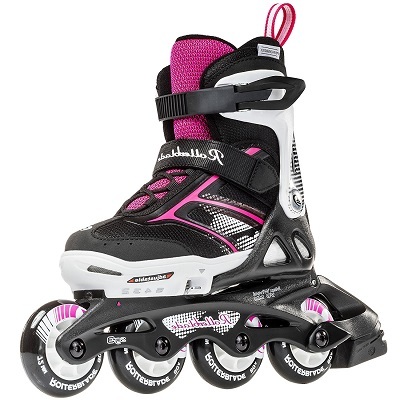 Colorful and full of fun lights, your skater will love these rollerblades. There are red, blue and green illuminating lights on these inline skates that will be a lot of fun for young skaters. No batteries are required to keep the lights running and they are set into wheels that offer a smooth and comfortable ride for the kids. 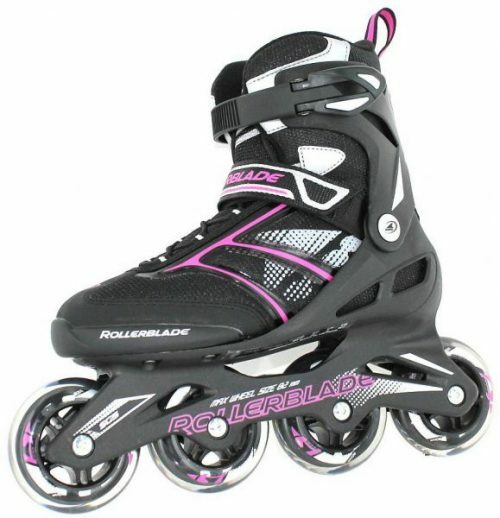 The rollerblades come with a 60-day money back guarantee so you can order your rollerblades with confidence. You can’t go wrong with a guarantee like this. 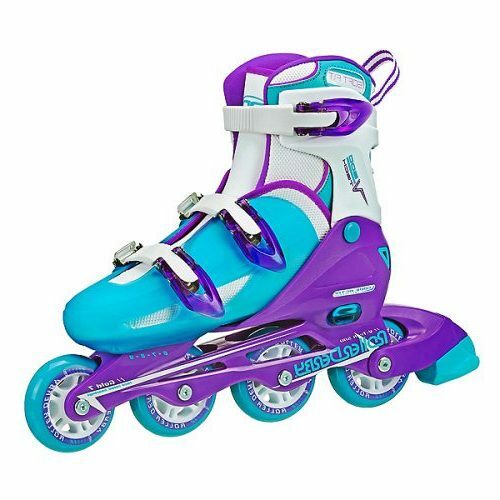 The rollerblades fall in the lower range pricewise which is a good deal for an inline skate that will adjust to your child’s growing feet and will supply your child with many, many hours of fun, outdoor activity. 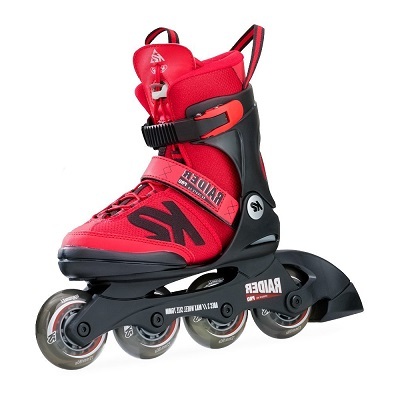 Excellent for beginner skaters, parents trust the Bladerunner Phoenix to give them long-lasting, great wearing, rollerblades that will grow with their junior skater. With a triple closure system, this skate will make sure the foot and ankle are supported and injuries will stay away. A great overall recreational skate, not only will you give your family the joy of skating but you will also be promoting healthy choices in exercising. Giving you style and performance will keep your kiddo skating for years to come. It Starts with the laces and tightening and loosening the old-fashioned way. With a standard set of laces, you can adjust the initial fit just like a pair of shoes. Next is the powerstrap, fully adjustable, this strap ensures laces stay in place as you rider starts trying those thrilling tricks and before that makes sure that long laces aren't getting caught in the rider's wheels which could cause unexpected falls. It ends with the buckle, also easily adjustable and gives security around the shin. The bearing used in this beginner skate makes your skater have great control with enough speed to really enjoy their ride. This is partially achieved with a low center of gravity that makes keeping balance much easier. As the skater develops these will offer a bit more speed and excitement making sure to maintain their interest. K2 makes a great skate, built with adults in mind. They have also made sure to keep your beginning or growing skater in mind too. Giving five sizes of adjustability these well-built skates will sure to last a growing foot for many rides to come. Knowledge and technology offer an innovative inline skate that will make this a trusted brand in your household. A smooth ride is expected and with the ability to change the wheel. Riders that quickly grow in skill will still have a rollerblade that meets their needs, for years to come, with all the growth potential these skates offer. No matter what level skater you are, you need a comfortable fit. The decreased vibration from this frame and base set up keeps the wearer feeling less and enjoying more. This is especially important with new skaters and when riding on rough terrain. We always want to make sure we can skate again tomorrow and a strong base, frame set up will help us skate every day if that's what we want to do! If you want to start in the hallway on the carpet or on the rink's wooden floor this skate will provide in all indoor environments. If your preference is a bike trail or sidewalk these will also suit you well. We never know when a rainy day could lead to an indoor party, rest assured if this is the party for the day, K2 will provide a great pair of skates to make a memory to last generations. 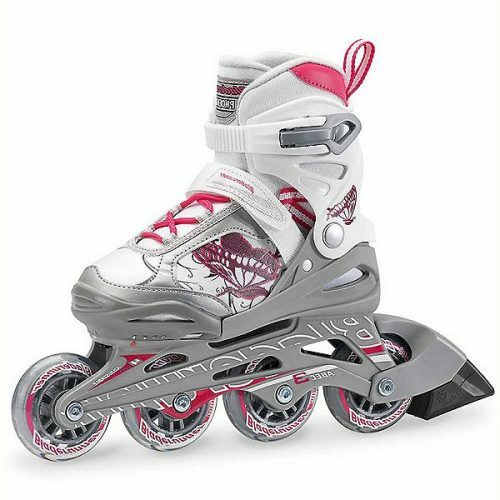 These rollerblades adjust with the press of a button which makes it easy for young skaters. There are also wheel lights which require no batteries to operate and are fun for kids. The inner shoe is comfortable and soft. 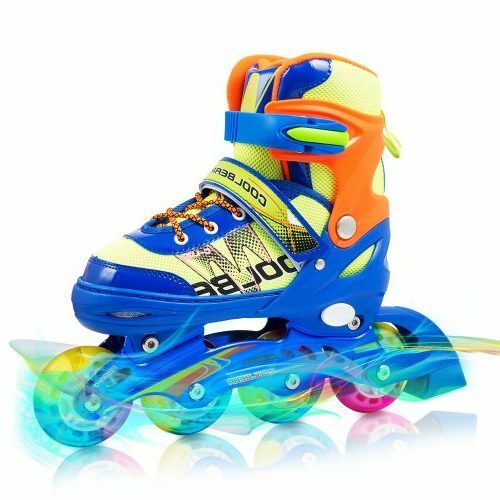 The overall build of this rollerblade is of good quality and the skate is very suitable for beginners. The skates are also guaranteed for your satisfaction. The inline skate closes with a ratchet buckle and the inner shoe uses both laces and a Velcro strap for the safety of your young skater and to provide great ankle support. Your child will have no problems taking the skate off and on and using them safely. The small size fits children’s sizes 12 – 2 and the medium size fits child sizes 2 – 5. As your child’s foot grows the fit can be adjusted with the touch of a button, making it easy for you and for them to adjust their inline skate. The Zetrablade, in particular, is made for the beginner to the intermediate level skater. Offering great support and a smooth roll if you choose to skate once in a while or plan to move from intermediate to expert this skate will have you riding comfortably. The type of bearing used alongside a wheel made for a smooth ride gives you support during the learning stages of your rollerblading future. Sometimes, there really is a thing as to fast. The wheel used on this skate is made for moderation. If you are new to skating or just a little afraid, it's ok because this skate will have you gliding along with great control and just the right amount of thrill. We know, the other great detail listed above, is also about learning. It is very important to know what you are doing when deciding to take up a new activity. If you don't learn to do it properly it may lead to injury, putting a stop to all your favorite activities. This frame is built with a low center of gravity. Keeping your pace moderate while you are picking up skills that will surely lead to a faster set of rollerblades. Roller Derby has also been mentioned in our guide prior to this. When looking for companies that can be trusted to offer a high quality, built to last, all around great pair, this one has yet to disappoint. The V-Tech 500 is adjustable for youth to adult sizing, something not often found in rollerblades. Growth potential in not only skill but in sizing makes this an awesome skate for a variety of riding situations. Easy on and easy off, the triple cam buckle system doesn't lack in support but makes it exceptionally easy to get in and out of your skates. If you show up to the rink late or just can't wait to get your roll on these won't hold you up for long. Simply push through and pull to tighten and press the button to release, get moving faster and enjoy the ride. The race rated bearing keeps the wheels moving with speed and efficiency. Add to the great bearing a urethane wheel, and what you get is speed at it's finest. Your stride will help increase your speed and you will leave your friends in the dust while racing around in these rollerblades. Style, support, comfort, and speed what more could you ask for in a top 10 skate? The closure system can have your feet feeling stable and secure or they can leave you sliding all over the place. A tight, supportive fit is essential to a positive blading experience. On the rink or through the neighborhood you definitely don’t want your feet to be sliding around. Not only is the closure important for stability but also for safety and prolonged wear for the rider. Keeping the foot secure with laces, a strap, and a shin clip is one of the best ways to make sure you aren’t getting blisters. In addition to blisters, you may get painful pinching and pressure from bad closures and this is a quick way to stop the skating fun. The other piece of importance when talking about pain and being unable to skate is the rolling of your ankle. The ankle is very sensitive and if not held secure can roll giving you awful pain and swelling. An injured ankle will have you sitting on the sidelines and why we made sure to offer skates that have great closure systems. A quick release strap may be the perfect thing for the rider. Easy on and easy off these types of closures tend not to be quite as secure but at a low speed, just for fun ride, it is a nice feature. Be careful, if your skill level grows and you are doing more tricks this type of closure may not be for you. Street Hockey games are increasing across the globe and secure closures are a must for this type of skating and while it may seem great to get your skates on and off quickly, they may not offer the stability you are looking for. Making sure to wear protective gear and opt for excellent closures will make sure that first-time rider is safe and wants to continue learning in this healthy and fun activity. If you are more advanced then, I’m sure you know what it feels like to take a nasty spill. Too tight or too loose is the real culprit for marking a pair of inline skates as “bad skates”. We must keep in mind the level of skill and what the blades will be used for when deciding which closure system works the best. First-time rollerbladers tend to have feet that are still growing and the ability to adjust to growing feet not only keeps costs down but ensures that your rider has a good fitting pair of skates for time to come. 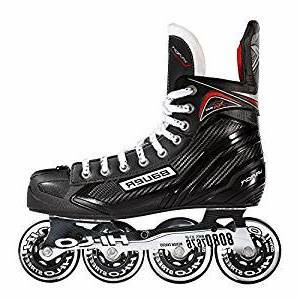 For more advanced and exceptionally skilled speed bladers, the need to adjust or remove your break, replace wheels, and customize your skate can be essential in the continued high-quality use of your skates. Some of these things are very difficult to accomplish and some very easy, we believe this needs to be taken into consideration. Still growing feet can change a shoe size more often than once a year in some cases. This can be very costly and frustrating to the parents and the budding skater. They want to skate but their rollerblades hurt their feet and all you keep hearing is how they need new ones. What they don’t understand is that it just isn’t in this month’s budget. If you find this to have been a problem in the past take a look at what great quality and price you can get in an adjustable size rollerblade. Spanning up to 5 sizes in growth you are sure to get longevity out of your investment. A fast-paced game of hockey or a stretch of bumpy bike trail that you plan on beating your fastest speed on today can be a real problem if you can’t easily make adjustments. Changing out a wheel or lowering your break can mean the difference of the best roll of your life and the worst. Making a sound investment in your skates and your gear is necessary for the serious rider and will help avoid injury and extra cost. Not all rollerblades are built the same and the construction of an inline skate is important to ensure safety and comfort throughout your ride. A well-built frame and connecting chassis will keep your skates performing at the top of their game. Also, making sure the inner boot fits well and you can close them in a secure and well fitting way leads to a thrilling, pain-free ride. Some frames are made of low-quality materials that may lead to cracking during wear. Falling and injury may result from a poorly constructed frame. You can also have a lot of problems with a low-quality frame paired with a low-quality chassis. Construction that gives you two low quality but high importance pieces will pretty much guarantee a bad experience. As a result, you should stick with companies that know what you need to have a successful ride, every time. A good frame and a bad chassis are almost as scary as having both pieces be of low quality. We definitely don’t want a wheel falling off or a bearing popping out because of poor design and poor materials. We have looked into superior quality materials and made sure this guide offers you a skate that won’t leave you in a pained position at the end of your ride or worse. No matter what you call it, inline skating, rollerblading, street hockey, the uses for rollerblade skates are endless. From fitness in general, to street hockey, these skates have become quite popular over the years for a number of reasons. If you're newer to inline skating, take your time learning how your skate react to your movements. Some wheels can move more quickly than others, and braking is a critical skill to learn before attempting hills or going full speed. Turning can be a gentle shift of your center of gravity, or a sharp pivot that requires you to lift some of your wheels off from the ground. Like any sport, the more practice you put in, the better a skater you'll become. To keep your skates turning over like new, make sure to clean off the wheels and bearings every now and again. As the contact surface between you and the street, wheels can tend to pick up debris, and also turn it up into the bearings of the skate. Regular maintenance will prevent you from slowing down, or worse, having a wheel stop spinning! Remember, how your feet feel at the end of your roll is a top priority. The enjoyment that you get from riding will have this activity as a top choice in your next exercise session. While you may be surprised at how great you feel and the fact that your feet aren't sore and if this is so, you picked a great pair of skates. Hopefully, this was due to the insightful context of this guide. q: Are there specific types of rollerblades? Yes, there are many types and you need to take into consideration what you will be using them for before you purchase. There are skates made for hockey, recreation, tricks, speed skating, and road riding. These are the most popular types of skates on the market and some can be used for multiple types of skating. A speed skate may be just what you want for a high paced hockey game and a recreational skate may also be your favorite for road riding. Our guide will help you take a look at the best choice for your preferred use. q: What is best for beginners? There is a big difference between beginners and those made for experienced riders. As a result, choosing a skate for a beginner you will want something that has a low center of gravity and a wheel made to keep speeds at a minimum until the rider has more experience. Most importantly, learning how to skate properly and wearing the right gear is of the highest importance when it comes to the safety of a beginning blader. q: What type of gear should I buy? Safety in any activity hinges on the right gear. Until you know your skill level and have confidence in your skate ability you should invest in a quality helmet, elbow pads, and knee pads. Also, learning how to skate and learning how to skate outside of the rink can lead to a lot of trips and falls. Therefore, keeping your head and joints protected will keep you riding and keep you safe. q: What skate will give me the best speed? Experienced skaters all want speed. 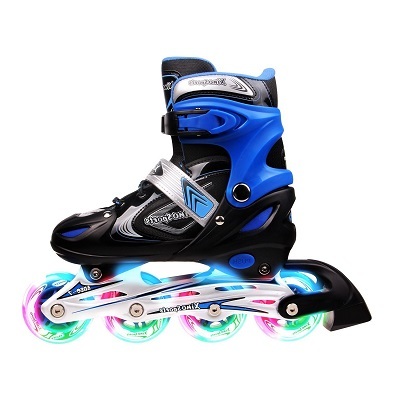 Rollerblades that have a wheel system that fronts the chassis with a smaller wheel and gradually ends with a larger wheel will increase your speed to unimaginable heights. Make sure if you switch to a faster speed skate that you take proper precaution with gear to prevent injury. q: Which are easier when learning, rollerblades or roller skates? This question has no easy answer. For most first time skaters your parents will buy what they think you need or what is required for the activity. Some may find roller skates easier, however, most find that a break on the back is much easier to use and has a decreased rate of falling. In addition, the design of the wheels makes balancing on them easier than most expect and give a smooth ride.